Workouts Every Monday From Now Till Christmas To Help You Find Your Form For Summer! We all look forward to summer; the warmer weather, the inviting beaches, and the chance to pick up our favourite outdoor activities after a long winter indoors. For many of us, summer is the time of year we want to be more active, feel confident in our summer wardrobe, and enjoy the mental and physical health benefits of spending time outdoors. But, after a winter of short days and cold, wet weather; the summer transition can come as a bit of a shock for our bodies. That’s where the summer workout series comes in! Workouts will be posted right here every Monday by 6.30am! Want to be reminded? Like and Follow our Facebook Page @Concept2NewZealand for updates in your News Feed! Subscribe to our mailing list to receive the workouts direct to your inbox! 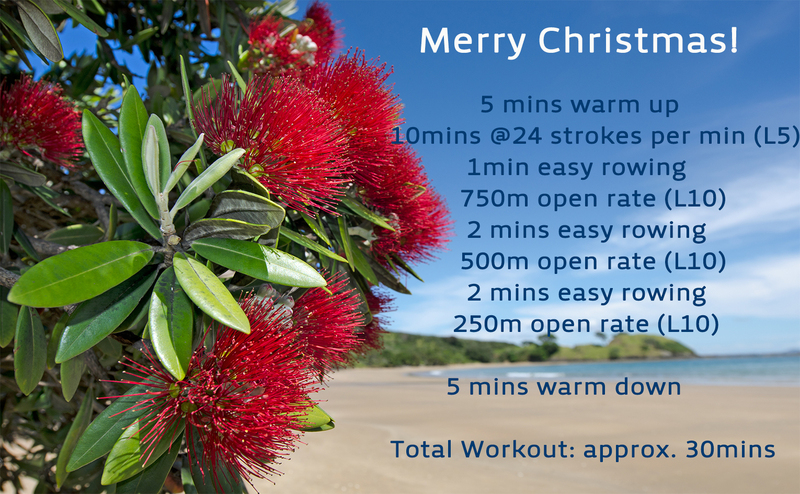 Today's workout, the final workout of the 2017 Summer Series, includes some short and sharp, max pieces for an efficient 'burn' session so you can get on and enjoy the more indulgent Christmas day traditions, with the confidence that you've earned them! 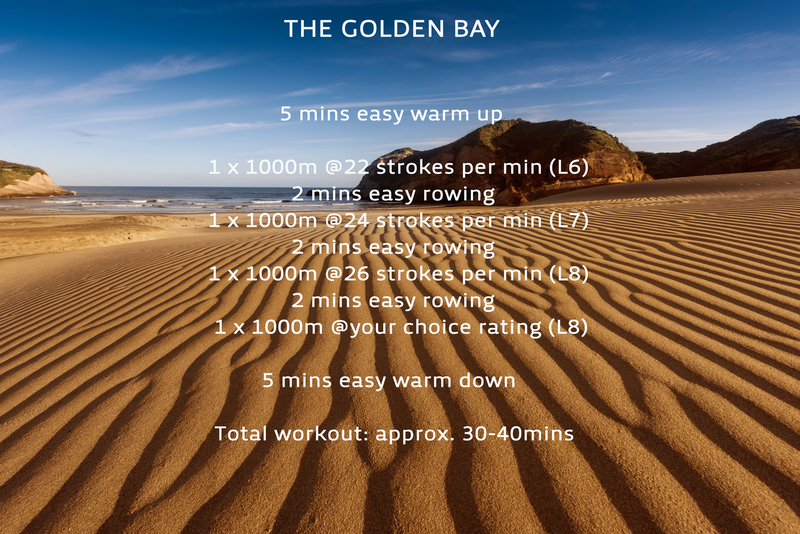 Use the first piece of 750m to get a feel for the stroke rate and intensity that you can sustain for the duration of the distance, and apply what you learn about your stroke and pace to the 500m and 250m that follow. As the distances get shorter, you can expect to be able to rate a little bit higher, and do so by adding power to the leg drive. The final 250m is very short and sharp, more akin to a sprint. While you may choose to shorten your stroke to begin with to get the flywheel up to speed, after the first 100m think about maintaining stroke length, particularly at the catch. The front of the stroke (the catch) is where you are at your most powerful, so you want to make the most of this phase of the drive, even in the midst of a mad sprint! We hope you've enjoyed our summer workout series! Stay tuned to our website for more workouts, training tips and motivation in 2018! This workout is designed to emphasize effort over distance, to give you an idea of pacing over commonly raced distances. 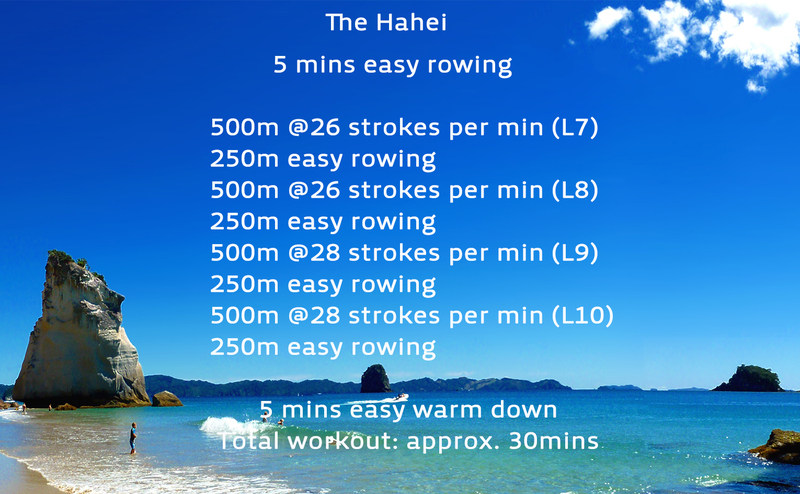 As the distances get shorter, your speed and intensity increases with plenty of easy rowing in between each distance so you should feel too tired by the time you start the 500m. 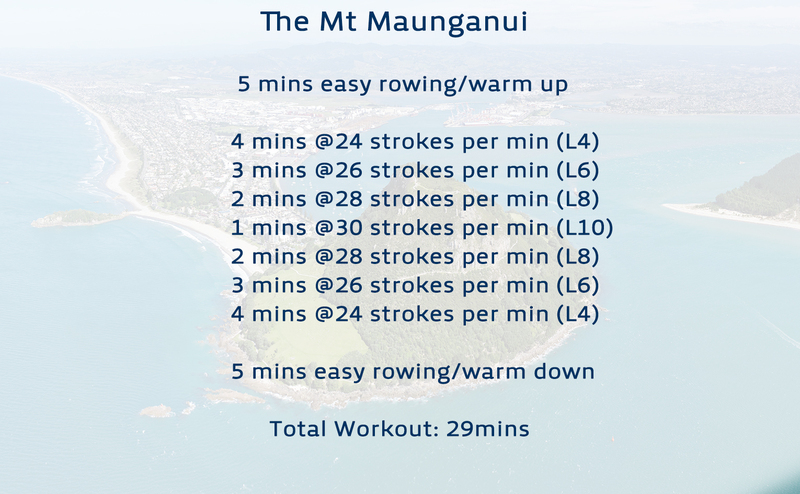 Set this session up on your monitor as 'intervals variable' so that you can keep track of both your distance and time. Remember to hold on to a strong, accelerating leg drive and a relaxed recovery even as your intensity and stroke rates increase to your upper limit. When you begin the 500m piece, try taking the first two strokes at half length, followed by a three-quarter length stroke before lengthening out to your full stroke. This will help you get the flywheel moving quickly, and make it easier to get your rating up high for this full speed piece. This workout continues to encourage correct stroke ratio, where you are seeking a powerful, accelerating drive phase, and a more relaxed, patient recovery phase. As you look to increase the ratings from 22 strokes per min to 24 (and above) focus on driving from the legs to generate speed and increased rating. In doing so you will achieve the greater exertion levels without having to focus on effort, while also developing your technique! Remember; the recovery phase of the rowing stroke is essentially the drive phase in reverse.The hands lead the handle away from the body, followed by the back, transitioning your body-weight forward onto the front of the seat, before the knees break and you begin to roll towards the catch of the next stroke. During the recovery the handle should move fluidly, but you should seek to roll into the catch more slowly than you would move backwards during the drive phase. These short and sharp, high-intensity pieces are set to encourage you to emphasize the drive and recovery phases of the rowing stroke at higher ratings. Approach this workout as two sets of 500m at each rating, with the first at a challenging, but sustainable effort level, and the second with a focus on intensity in the leg drive, and relaxation on the recovery. Use the second 500m at each rating to generate the stroke rate through the legs on the drive to give yourself more time on the recovery. 5- Repeat steps 3 & 4 untill you have all four 500m intervals and all four 250m intervals entered. 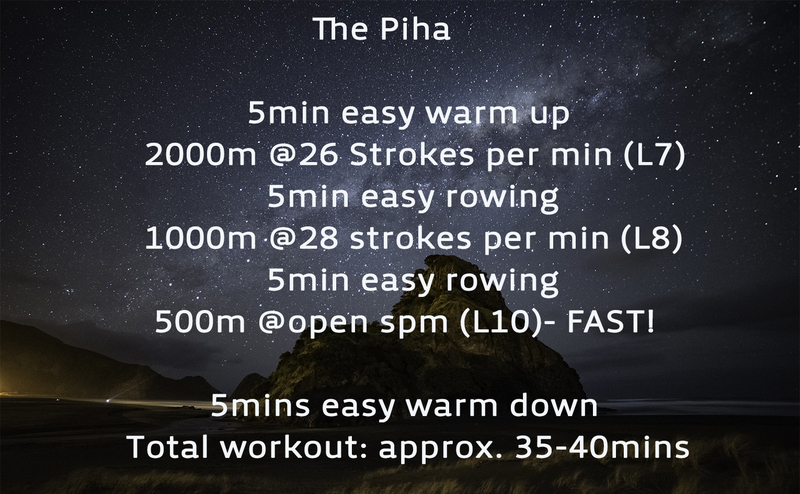 This workout offers sustained intervals of intensity over 1000m, allowing you to adjust to the set stroke rates and find the rhythm of your rowing stroke. The gradual increase in intensity in each 1000m will make it easier to pace, with each piece getting slighter faster than the last. Be sure to use the 2mins in between each interval to relax, especially in the upper body which can be inclined to tense unnecessarily when the intensity increases. This workout varies in intensity, but everyone measures their effort differently. To make sure everyone has a reference point for intensity that makes sense to them, we have graded the intervals from Level (L) 1 - 10. On this scale, 1 represents very easy exercises, 5 represents moderate effort, and 10 is hard or fast as you can go! When increasing the stroke rate, think about moving your hands away at the finish of the stroke at the same speed that they come in to your body, leaving no room for pause in the stroke. This will help you find a continuous rhythm, and a smooth increase in stroke rate without cutting the length of your stroke short. 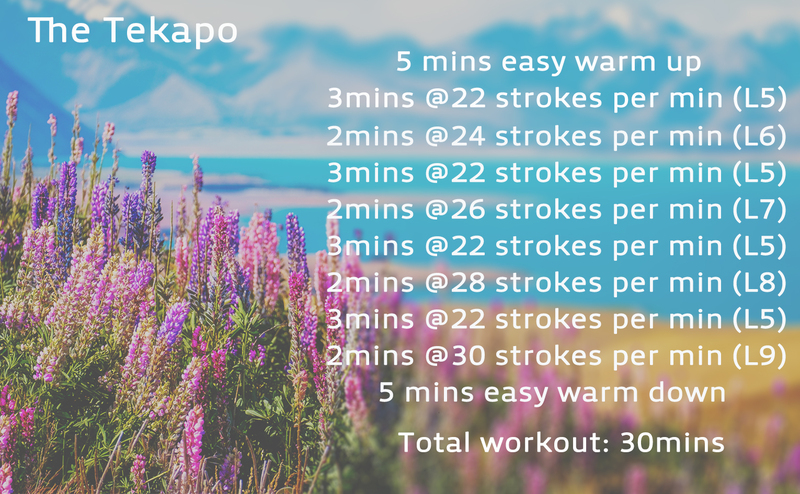 As you can see with this workout, the higher your stroke rate goes, the harder you will need to work with your legs, meaning your intensity level will increase. If you are unsure how to pace, for this first workout take each step a little easier than you might expect- better to finish the workout than have to pull out early!